Matthew Tipton has parted company with Warrenpoint Town by mutual consent. The 37-year-old has been heavily linked to take over at Portadown following the departure of Niall Currie, but took charge of Point's 5-0 defeat at Glentoran on Tuesday night. However, Milltown officials confirmed on Wednesday morning there had been a parting of the ways following a discussion with Tipton. A statement by Chairman Connaire McGreevy on the club's official website said: “After a conversation with Matthew last night we have parted ways by mutual consent. 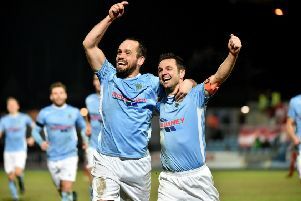 “Warrenpoint Town is a club in transition and the positive moves forward continue on and off the pitch. “We have appointed UEFA A coach Stephen McDonnell, a former international player and player of Warrenpoint, Celtic and Dundalk as interim manager until the end of the season." Tipton is believed to be meeting with officials at Portadown on Wednesday afternoon to discuss taking over at Shamrock Park.